One of the hardest things about a new disability is letting go of dreams. I know we all give up dreams as our lives take different paths to those we had planned. And I know that I just need to create new dreams that are achievable for the ‘new us’. I grew up in a camping family. Our idea of the perfect holiday was camping by the beach with close friends. There were about 5 families in our regular group, consisting of lots of kids, and many happy, drunk parents. All my fondest memories as a child are around these trips and the people who shared them with us. One of the families, the Morrises, were, and still are, like a 2nd family to me. After several years of tent camping, they decided to buy a pop-top camper. Well, I was so envious – when I grew up I was going to own one of those! That dream never dwindled, and about 4 years ago, I found myself picking up a brand new Jayco Swan. Heading off on our first trip, Steve by my side and 4 excited kids chatting in the back, I thought life couldn’t get much better. And, it didn’t. 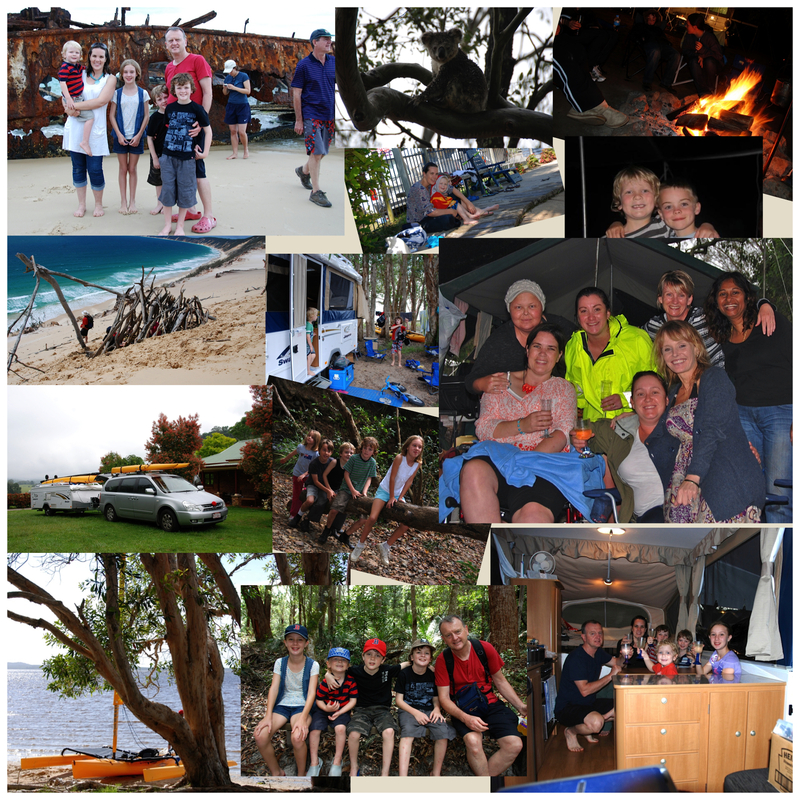 For the next 2 years, we camped a lot, mainly around Queensland’s magnificent Sunshine Coast. We had found our own camping family and were creating some fantastic memories. One of my best friends, Mel, was determined to lead me astray. She became my most regular camping drinking buddy (along with Lisa). When I was in ICU, Mel sent down some photos from various camping trips. Steve hung them on the wall by my bed. 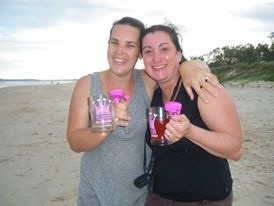 I can remember looking at them and wondering if we would ever collect shells on the beach again, with our princess cups in 1 hand full of gin. I used to look at that picture a lot – I could never work out if it made me happy or sad. A little bit of both I think. Anyway, after careful consideration, and 3 post-stroke camping trips, we decided the camper no longer suited our needs. So sadly, we let it go. It felt like we were letting go of the dream. My brother sent me a message today letting me know he and his wife had purchased a Jayco Swan. His text oozed the excitement we felt when we purchased ours. I am so happy for them. I know they will create so many family memories. At the same time, it made me so sad. It reminded me that the same plans and dreams had been ours – and now that dream for us was over. Like so many other dreams, there is no choice but to let them go. The good news is, I have realised that I am alive, and new dreams can be created. About 6 months ago, I was in a pretty dark place. How could I possibly achieve the things I wanted as a wife, Mum and friend. 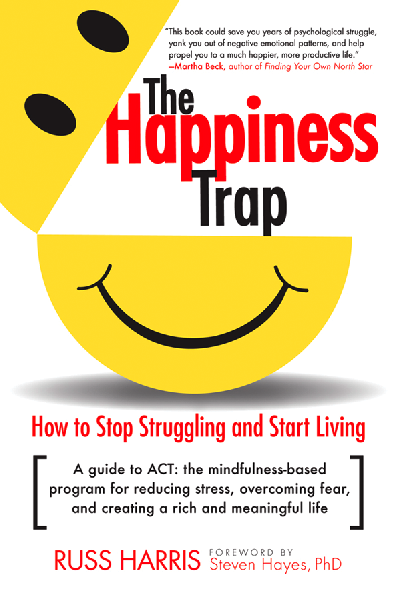 At the time, my social worker suggested I read a book called ‘The Happiness Trap: How To Stop Struggling and Start Living’ by Russ Harris. Here we go again, I thought. Another self help book. I assumed it would be a complete waste of time, but was desperate enough to give it a try. Plus I adored my social worker and really respected her opinion. So I downloaded the book on my iPad and started reading. 4 hours later I looked at the clock – wow, I was hooked. I want to share with you the lesson that changed my life. Keep in mind this is my interpretation. I might have it completely wrong, but it worked for me. Russ Harris talks about a goal-centered life versus a value-centered life. A goal-centered life becomes a struggle to achieve certain things. It is about striving for something in your future. And when we achieve a goal, we tick it off and start looking for the next one. If we live our lives constantly striving for something, are we ever truly happy now? In contrast, a value-centered life is about sorting out what values you want to live you life by. Have goals, but look at the values underpinning those goals, so you can live a happy and meaningful life now. Have I completely confused you? Goal – I want to walk. Why? What are the values underpinning that goal? Values – to be a great Mum, who is involved in the kids lives. So then I thought logically about those values. Walking would make it easier for sure. Was it necessary? No. So I realised I could start living my life around those values today. I started playing board games with the kids, we bought jigsaw puzzles and card games, I realised I couldn’t kick the footy with the boys, but I could watch and call out words of encouragement. I really want to walk, but if I don’t, I can still be the Mum I want. Sure it looks different to what I had planned, but so what? So our Jayco is gone. We have found other ways to live by the values we sought to live through camping. We create family adventure and memories in other ways. For example, we go to the snow. Clearly I can’t ski. But when the kids come in for a break, they love telling me about their latest adventures, and I love hearing about them. It’s not what I would have chosen. I would rather be skiing with them. For now at least, that isn’t possible. It looks very different, but that’s ok. We have had plenty of adventure and created lots of memories. Life doesn’t always turn out the way we planned. But if we live by our same values, then our lives can have the same meaning in the end. I recommend this book to you all. We all have struggles. This book changed my perception of life with a disability. Pete and Courts – I know you will love your camper. I hope you create as many good memories and friendships, as we did in ours. I really am enjoying reading your posts and having a glimpse into your new life warts and all. I’ll definitely track down the book as it sounds like a good one. I love your honesty and how you are allowing us to learn from your life experiences. Thanks Steph. Steph. I wait for your blogs!! You write so well. Each one has been inspiring and believe it or not on occasions helped me with some tricky worries by putting things into perspective. You have a real nack with writing I’m hooked, keep it up. God Bless you steph, your words are inspiring.